One of Abraham Le Blond’s ovals, this print was published about 1856 using the Baxter Process. Le Blond published a total of 32 ovals of a similar size between 1853 and 1870 – these ovals were, and still are, some of Le Blond’s most popular prints. 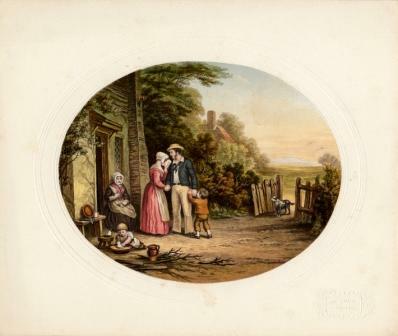 This print shows a sailor bidding farewell as he sets of for duty, probably in Sebastopol. Many artists painted similar scenes but it is now thought this print is after a painting by John Anthony Puller (1799-1886) who was the source probably for all the ovals. The print is shown complete on its original Le Blond mount. It would have been printed directly onto plain paper which was then embossed to form a border around the print with an embossed title and number below. It is signed on the bottom centre “Le Blond & Co., London,” and sometimes in addition there is “L. A. Elliot & Co., Boston, U.S.,” - it is rarer with the two signatures. L. A. Elliot & Co. was a print selling business set up by Lucius Elliot and trading under this name from 1875 to 1884. They imported and distributed Le Blond's prints in the USA. Size 5 x 6 1/2 inches approx. Le Blond number 78.